At Summitt, we believe in being as honest as possible with all our drivers. Our recruiters are not paid a commission, so they have no obligation to anyone but YOU. We want you to be confident Summitt is the right fit for you, so we recommend that you ask us any and all questions you may have about our company. To get you started, below is a list of frequently asked questions. What are the lanes I will be on? Will I be on a consistent lane, or will it vary? Up to you, Driver! We have static lanes out of Louisville, Indianapolis and Cincinnati. We also offer City positions (based on current availability) out of Louisville, Indianapolis and Cincinnati. We hire OTR drivers from almost anywhere east of the Mississippi. Great question! Here at Summitt, we have coined the term ‘Staticated’ or static lane to describe many of our lanes. This is our way of saying you’ll be on a consistent lane. Many companies will run dedicated lanes from point A to B, but we will run ‘Staticated’ lanes from point A to B, sometimes to C, but we always get you home according to that particular lane’s schedule. Static lanes are a great way to get consistent miles and get the home time you want. What kind of miles will I get? Again, that’s up to you! Want to stay out for weeks at a time? Go for it. Would you like to get on a static lane to get you home every other day? If we have an opening for a lane in your area, we will gladly accept you. Home nightly? Ask about our city driving jobs in Louisville, Indianapolis and Cincinnati. Our average solo OTR drivers get between 2500 and 3500 miles/week. We have static lane drivers getting anywhere from 2400 consistent miles to 3600 consistent miles. Will I have a dedicated driver manager? You sure will. Every DM here has about 20-25 drivers they are dedicated to. Is your freight no touch? Where are your main hubs? General commodities. All dry van and some reefer. If road conditions are unsafe to drive due to weather, will I be penalized for parking until it is safe? Safety of our employees and the general public always takes priority. What will my schedule be? When is my home time? Our Static Lane drivers get home on a regular, consistent schedule – some of these drivers are home every other day or every two days. Summitt OTR drivers are home every 7-10 days, unless they ask to stay out longer. All of our trucks are 2014 and newer. We run mostly Freightliner Cascadias, but we have some Volvos and Internationals in the fleet. Are your trucks automatic or manual? 80% of the trucks in our fleet are automatic. If you have a preference for a manual, we have some available! Inverter policy? APU in trucks? Most of our trucks come with an inverter. In a truck without one? If you would like an inverter, let us know! Our shop will put one in. Most trucks have an APU. If the truck does not have an APU, you are authorized to idle. Refrigerators? Do they come in trucks? Many of our trucks have refrigerators. If you are in a truck without one, we offer you a plug in cooler, free of charge to you. Do you have slip-seat trucks? We only slip-seat city trucks. Only in some instances will OTR trucks be shared on occasion. If OTR or static lane drivers are far from a terminal and/or drop yard, we will evaluate to determine if you have a safe place nearby to park. We will evaluate on a case by case basis. Call us to find out! For the safety of our employees and the general public, we govern our trucks at 65mph. It helps with the fuel economy too! What is your passenger policy? OTR and static lane drivers can have a rider. Rider must be approved through safety. Any cat or dog under 40 lbs that is approved can ride. Call to find out how to get your pet approved. What is your driver pay? Our solo Dry Van OTR Drivers start anywhere from .43 – .51 cpm based on experience and work history. Our dry van teams start between .60 – .70 cpm split. We pay holiday pay, New York pay ($100 for delivery) in one of the five boroughs (Brooklyn, Queens, Bronx, Manhattan, and Staten Island) and Canada pay ($100 for delivery + an additional 2cpm en route to Canada). We pay stop-off pay and layover pay. Yes, we offer full benefits. Medical, dental, vision, life, 401K, and paid vacation. 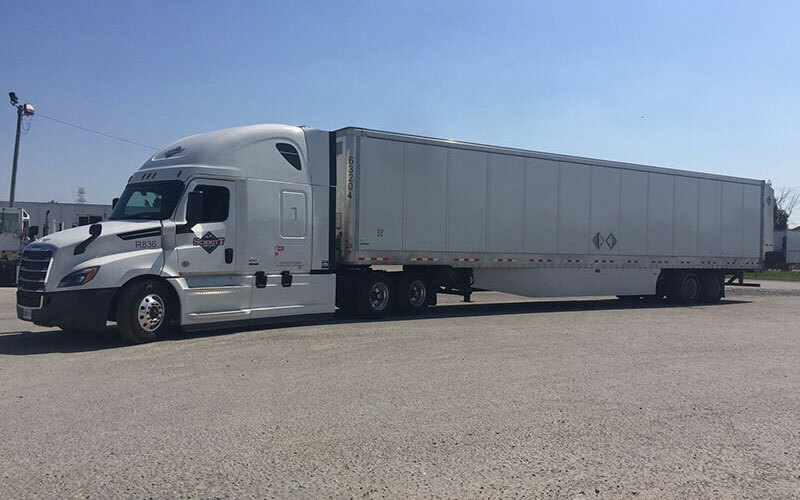 Yes we pay a new customer bonus, a clean inspection bonus of $100 per inspection, Safety Bonuses every 4 weeks and annually, a Performance Bonus every 4 weeks and Driver Referral Bonuses. What can I expect my annual earnings to be? As a Company Solo Driver you can make up to $75,000 annually based on .43 cpm. Team drivers can make up to $86,000 annually based on .60 cpm split. We have bonuses and incentive pay that can earn you more money. How does the pay period work? Do you use TRANSFLO? Do bills have to be sent in by a certain day to get paid during a week? Our pay period begins on Sunday at 12am and goes until Saturday at 11:59pm. Bills must be scanned within 24 hours of delivery. We have a Summitt Transflo mobile app to make this process quick and easy for you! What miles are paid miles and what miles are not? For company drivers all dispatched miles are paid, loaded and empty. Miles are paid based on PC Miler version 25. Orientation is at our company headquarters in Clarksville, Indiana. Orientation is three days, but we have an online training module that if you request, you can get a head start on the required courses. We require all drivers to pass a physical, drug screen, driving test and complete a ride with a current Summitt driver. What is the pay during Orientation? We pay Company Drivers $200 for the first two days in Orientation and the third day is “first day on the job” and is paid $15.00 per hour while with a City Driver learning Summitt ways. Are travel, lodging and meals paid for during Orientation? Yes. We arrange your travel, lodging, breakfast is provided by the hotel and lunch each day is provided by Summitt Trucking LLC. Is your company publicly or privately held? Summitt is a family owned and operated privately held company. Dave Summitt stills runs the company to this day. About 200 drivers and about 80 office and maintenance employees. About 200. Just under 50 of those are Owner Operator.